Bill Johnston is a laureate of the awards granted by the Book Institute: Transatlantic Award and the Found in Translation Award (the latter is granted by the Institute together with the Institute of Polish Culture in London and the Institute of Polish Culture in New York), the author of the latest translation of Pan Tadeusz into English: Pan Tadeusz: The Last Foray in Lithuania (Archipelago Books, 2018). During his studies (Russian and French philology) at the University of Oxford, he received a scholarship for a Polish language course at the University of Warsaw. He is particularly connected with Cracow and Wroclaw. He lived in these cities after graduation, in 1983-1991 and worked as an English teacher on behalf of the British Council as well as a director of the English Language Center. His students from that time include professors Jerzy Jarzębski, Leon Kieres, Tamara Trojanowska. He lives in the USA. Currently, he translates and teaches comparative literature at Indiana University. 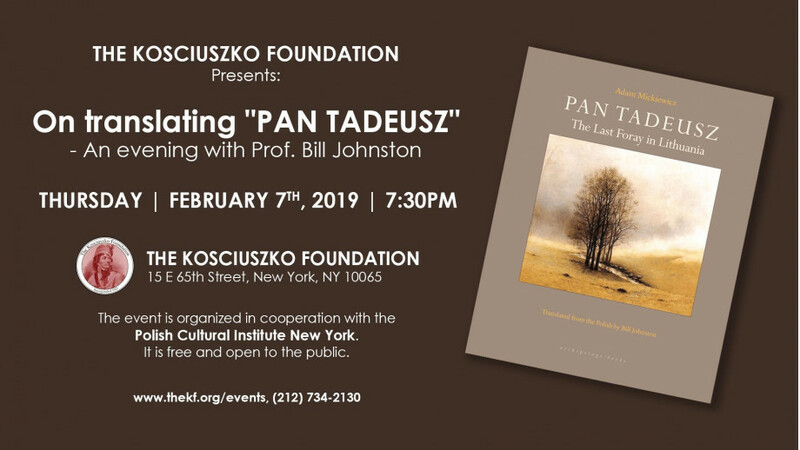 The meeting is being organised by the Polish Cultural Institute in New York together with the Kosciuszko Foundation.